The Writer's Challenge: "First Draft in 30 Days"
"First Draft in 30 Days"
Perhaps it's because I've been living with my Hero and Heroine for so long, so I know them as well as I know myself - but it wasn't difficult to add a couple of romantic love scenes and an extra kiss in the places where I knew the characters wanted to be with each other. They had previously been kept from consummating their passion by the fact that I was nervous about my father reading the book! So I got a lot done yesterday. I also emailed out the first chapter to my book to my writing teacher, and so far the response has been quite positive. Yay! I could have gotten even more done and worked more on "Snowed in with a Millionaire", but all work and no play makes Jack a dull boy, so I stayed up late watching "The Biggest Loser" on Hulu.com. I was amazed that they could lose like 25 lbs in a week. Seriously. I pulled another book off of my shelf to review for you, "First Draft in 30 Days" by Karen S. Weisner. Titles like that hook me every single time. I love the idea of writing a book in a month. It hasn't happened yet, but I still love the idea. Really what the book guides you to do is to create a very detailed outline, similar to the 40 page plot synopsis I've been writing for my work in progress based on 'The Marshall Plan for Novel Writing" by Evan Marshall. Weisner has written over 20 books, so her method must work for her. Unfortunately, the book is a bit dry. My main problem with it is I don't jump up and down with inspiration as I read it. On the other hand, another book that promotes writing a first draft in 30 days, "No Plot! No Problem" by Chris Baty, the founder of National Novel Writin g Month, does make me get all excited and ready to write. So there you have it. By the way, NaNoWriMo is coming up in November and I'm seriously considering joining in on the fun. 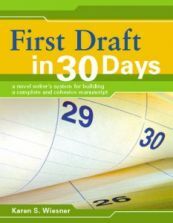 Left brain thinkers might like "First Draft in 30 Days" more than I did. Weisner does have a lot of good information and suggestions, however - including letting your outline sit for a while before you go back and look at it. I remember Stephen King said in his book "On Writing" that he did the same thing. Today my goal is to work on my plot for "Snowed in with a Millionaire". Wish me luck and good luck to you too! Stephen King says: ya gotta read to write! Do you want to write a novel too?